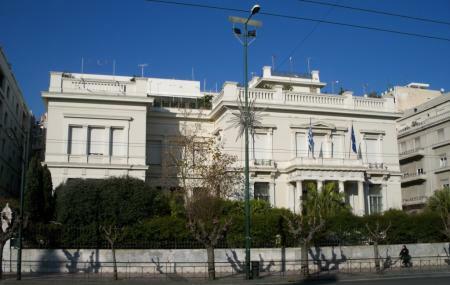 Find hotel near Benaki Museum Of Islamic .. The first Gallery: Exhibits from 7th to 12th century, highlights being luster pottery, door panels from Iraq, Fatimid metalwork, and a beautiful reed mat from 10th century Tiberius. The Second Gallery: items from 12th to 16th century including Seljuk ceramics, Mamluk metalwork, and a small brass box bearing the signature of Ismail ibn al ward al Mawsili dated 1220 and the astrolabe of Ahmad ibn al Sarraj dated 1328/29. The Third Gallery: This section houses a marble lined reception room that belongs to a 17th century mansion in Cairo, Iznik pottery and 16th century velvet saddle from Bursa. The Fourth gallery: Qajar jewellery and arms and armour. Closed on Epiphany, Easter Day, Easter Monday, Clean Monday, Holy Spirit Day. How popular is Benaki Museum Of Islamic Art? People normally club together Amphiareion Archaeological Site and Saint Demetrius Loumbardiaris Chapel while planning their visit to Benaki Museum Of Islamic Art. I enjoyed everything from the horses armor to the ornate knives. Glassware, ceramics, and fabrics from the 7th century to the 1800s. Fascinating styles and designs, different than other cultures. Each room shows a different period and has a maps displaying the area ruled by each of the empires. Four (somewhat small) storeys full of Islamic art, arranged periodically with the earliest objects in the first floor and the latest in the fourth. Item descriptions are given in Greek and English, though some items aren't given any descriptions at all. The cafe at the top of the building offers some nice vistas over Athens, and a free wifi is available. When it comes to coffee, I'm just going to keep it nice and stay silent because, well, I don't have anything nice to say about the coffee. The museum is bit off from the most touristy areas. That, of course, is either a plus or a minus, depending on your point of view. In any case the museum is easy to reach with multiple bus routes and the 21 trolley route from Omonoia. Superb museum with great quality content but, as importantly, great multidisciplinary explanation of the context of the objects presented. I enjoyed it very much and let's not forget the bar on the top terrace with a beautiful view of the Akropolis.